The global economy is in a period of growth, meaning more and more goods need to be delivered to the right place and at the right time. Unfortunately, it looks like the logistics industry as a whole is struggling to find an adequate number of drivers to keep up with demand. With truck drivers hauling more freight and racking more miles, the stakes have become higher for supply chain managers to find capacity to move their goods. One of the largest issues causing the driver shortage is the high average age of the existing workforce. According to the American Trucking Association (ATA), the average driver age is 49. As these drivers approach retirement over the next 10 to 20 years, the shortage will worsen. The age requirement (21 years) also limits the number of young workers to start their careers in trucking for interstate drivers. Since Many potential drivers choose another career path rather than waiting three years to get a job. The industry has also struggled to diversify; women and minorities make up less than 30% of the workforce. Companies may need to consider other recruiting and hiring strategies (and overcome unconscious hiring biases) to attract a diverse workforce and close this gap. With increasing regulations, trucking companies have become selective when it comes to hiring drivers. Since new drivers often lack proper qualifications or hold an imperfect driving record, this limits the pool of potential candidates. Even when there are plenty of applicants, criteria based on driving history and experience prevent candidates from joining the industry. 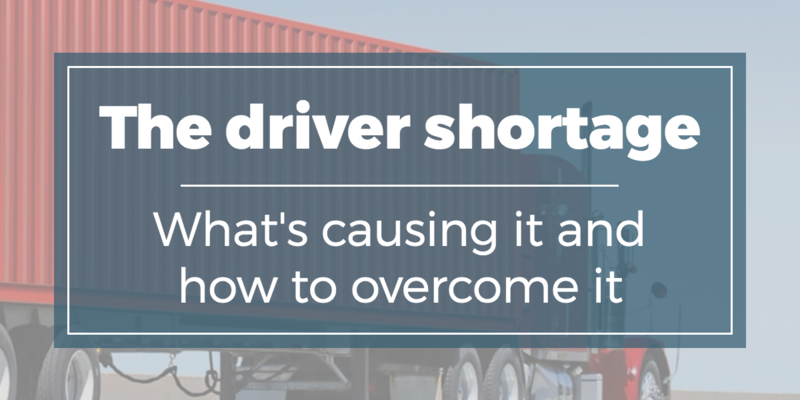 Economically, the shortage usually translates to higher pay for qualified drivers. This impacts supplier costs and thus, consumer pricing. That's why many industry experts are calling on trucking companies to take action to reduce the shortage. Increasing regulations also play an important role in transportation efficiency and productivity. Some say the “knights of the road” are a dying breed because of the regulatory factors and governing of the industry. Drivers are now required by law to comply with regulations that reduce flexibility and productivity. Infractions come with heavy consequences. When drivers incur violations in their record or during inspections, it can negatively impact a company’s Compliance, Safety and Accountability (CSA) score, which sometimes results in dismissal. With the ELD mandate in place, changes to truck drivers’ hours-of-service limit the time drivers have to deliver freight. While larger carriers have been using electronic logbooks for years, many small fleets and owner-operators are struggling to adjust to the new reality. More experienced drivers who are accustomed to using paper logbooks may need more time and effort to adapt. For some trucking veterans, the added labor and cost of equipment makes the job less attractive than it used to be. But it doesn’t have to be this way. With enough knowledge and preparation, the benefits can outweigh the cost and effort. Embracing the possibilities of ELD technology and adapting company-wide processes can help reduce operating rates and improve the bottom line. In addition to the catastrophic loss of lives and property, Hurricanes Harvey and Irma also caused huge disruptions in freight transportation across the country. The capacity crunch hit Houston particularly hard, as it is a transport hub for rail, sea, and trucking. Shipments were re-routed multiple times to resume inventory for the storm-affected areas and surrounding regions. In the wake of natural disasters, the Federal Emergency Management Agency (FEMA) calls for truck drivers to transport supplies and goods to impacted areas. Because FEMA pays competitive rates, drivers from independent owner-operators often take the higher paying jobs. This migration from the supply chain to FEMA adds more strain to corporate trucking. In a year like 2017— which included hurricanes, wildfires, hailstorms, and other natural disasters— this is particularly noticeable. Another weather-related factor that tightens capacity: icy roads. When conditions are hazardous, fewer vehicles are able to navigate roads, and capacity tightens. In this circumstance, rates skyrocket and shippers bear the brunt of it. The heavy cost of repairs and other necessary renovations doesn’t help; as carriers’ profits fall, drivers' wages do too. This contributes to compensation difficulties that can hinder retention of truck drivers. When unpredictable elements threaten to derail a supply chain, a 3PL can help you find solutions that fit your timeline and budget. By consolidating shipments, optimizing routes, and calling on their network of trusted carriers, third-party logistics providers can help you secure transportation capacity for your freight. The driver shortage (and the associated rise in transportation costs) affects the entire economy. To stay ahead of the curve, it’s always wise to draw on your 3PL’s expertise. Even in times of tight capcity, a strong partnership with an experienced third-party logistics provider can help cut costs and improve processes for safety, efficiency, and profit.